Just Get Fit Which is better for weight loss? Screw perfection, sometimes you’re just trying to make the best possible choice at the time. It isn’t always about what is better but what is realistic. When hungry strikes and I’m out, I’d rather eat the protein/granola bar in my bag instead of grabbing something snacky and calorie dense. Sure, it would be great if I always planned ahead and had fresh fruit, veggies or a protein shake with me, but I’m human and that isn’t always my reality. Granola and protein bars are super quick and convenient but they aren’t the best option if your goal is weight loss. They are generally calorie dense and not as filling as other lower calorie foods like fruits and vegetables. However, I do remind clients that they can still be good in a pinch when trying to make the “best” decision. The reality is sometimes we end up in situations where we are unprepared or hungry and don’t have our go to healthy options. But, in the long run, being prepared will always serve you better. 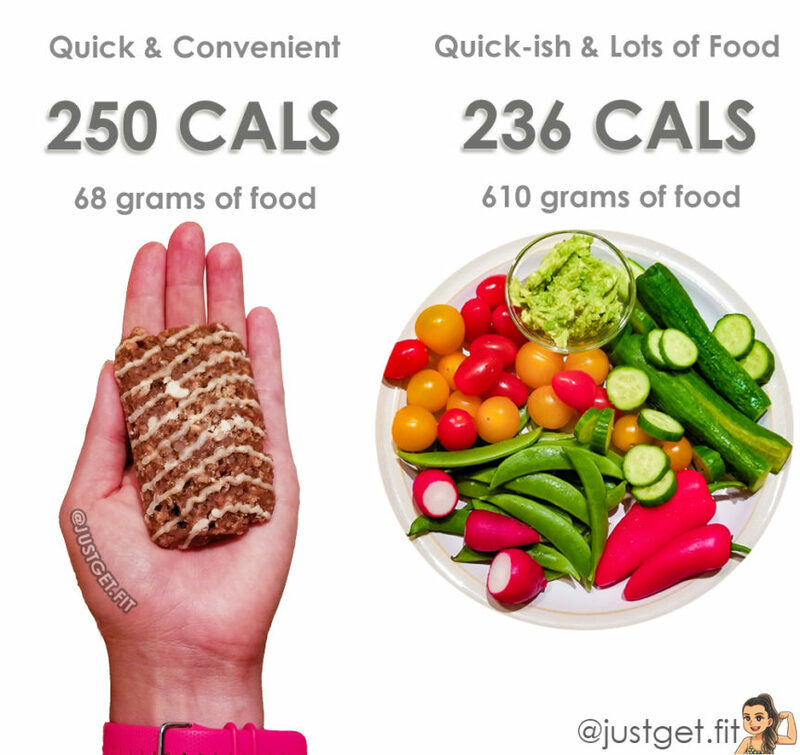 While I might not want to carry around a bag of veggies and homemade guac, a piece of fruit or something like a banana for 100 calories is going to fill me up in the same way the 250 calorie bar on the left would. I choose the right side 80% of the time, but I think there is a time and place for both.